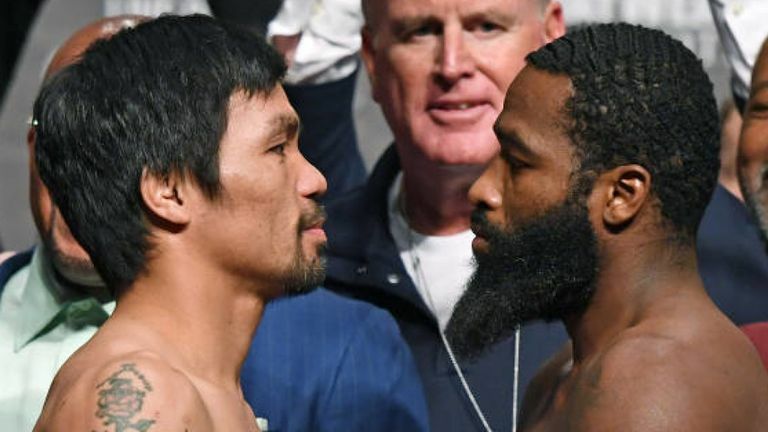 MANILA, Philippines – Filipino boxing icon Manny 'Pacman' Pacquiao returns to the ring to defend his WBA Welterweight title against the former four-division world champion Adrien 'The Problem' Broner in the much-awaited fight on Saturday, January 19 (Sunday, January 20, Manila time). The big showdown of the year happens at the MGM Grand Garden Arena in Las Vegas which also marks the first time Pacquiao (60-7-2, 39 KOs) returns to fight in the United States since 2016. The camp of the Pinoy boxer is confident to win the match and they are nostalgic with Freddie Roach back in his corner. Pacquiao's three longtime cornermen Roach, lead trainer Restituto “Buboy” Fernandez and conditioning coach Justin Fortune joined him in preparation for the bout against the Cincinnati boxer (33-3-1, 24 KOs). Fernandez believes Pacquiao can end the fight in fourth-round KO. UPDATE: Pacquiao wins via unanimous decision (117 - 111, 116 - 112, 116 - 112), retains world welterweight title against Broner. Pinoy fans can catch 'Pacquiao versus Broner' via satellite on GMA-7 beginning 10 am while an exclusive blow-by-blow coverage of the fight will also air on GMA's flagship AM radio station Super Radyo DZBB 594 and in all Super Radyo stations nationwide from 9 am to 1 p,. A replay of the bout will be aired on the same day at 10:30 pm on GMA Sunday Night Box Office (SNBO).